On the western (right) side of NGC 604, the amount of hot gas found in the bubbles corresponds to about 4300 times the mass of the sun. 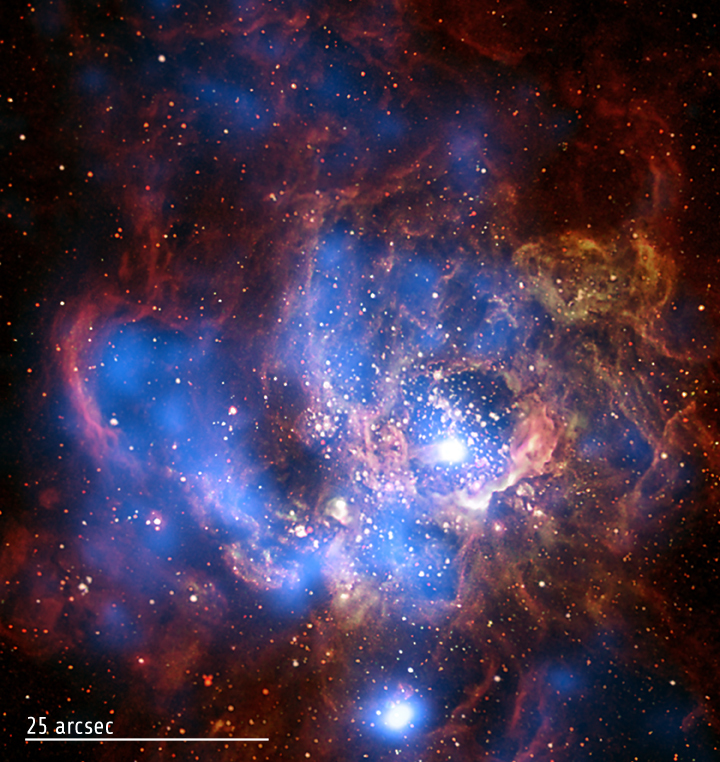 This value and the brightness of the gas in X-rays imply that the western part of NGC 604 is entirely powered by winds from the 200 hot massive stars. The implication is that in this area of NGC 604, none or very few of the massive stars must have exploded as supernovas. 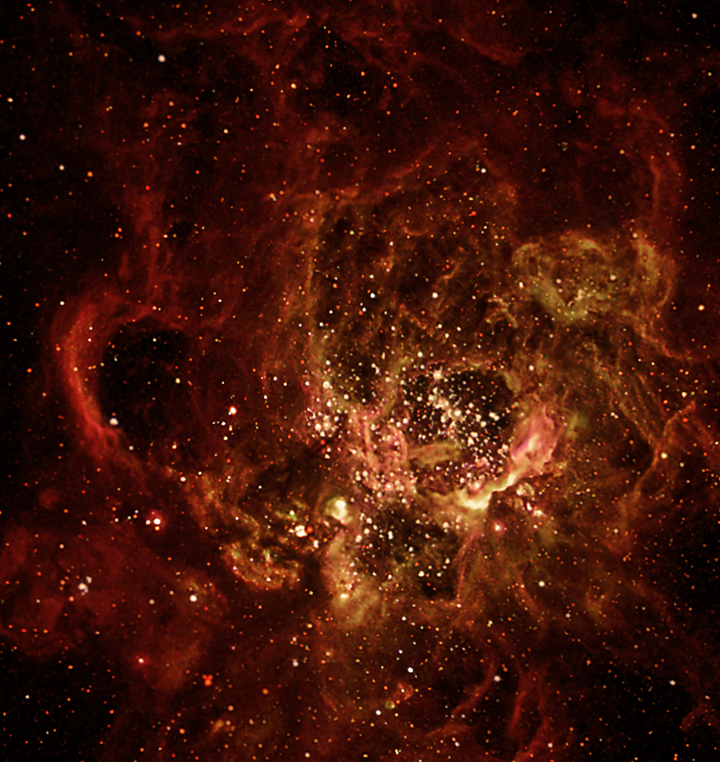 The situation is different on the eastern (left) side of NGC 604. 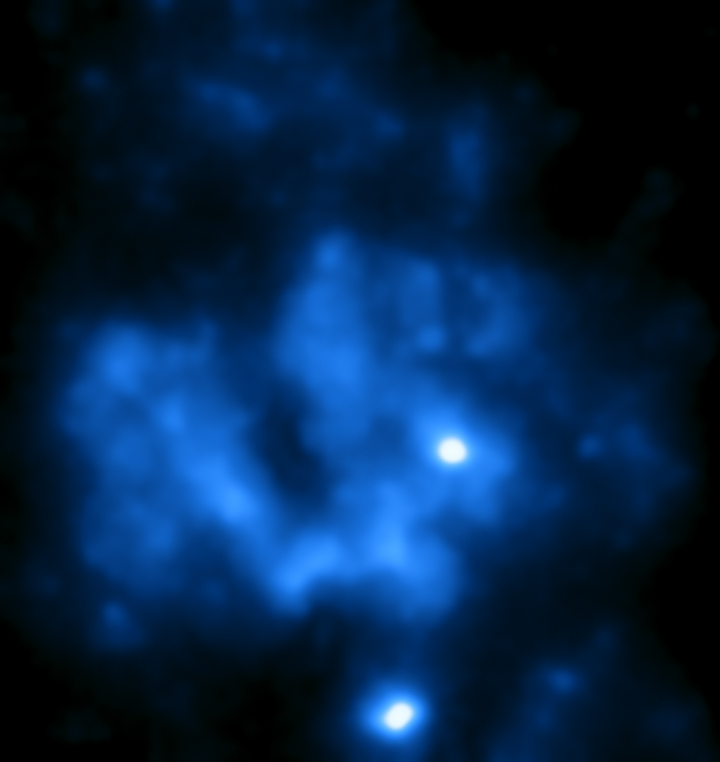 On this side, the X-ray gas contains 1750 times the mass of the sun and winds from young stars cannot explain the brightness of the X-ray emission. The bubbles on this side of the cluster appear to be much older and were likely created and powered by young stars and supernovas in the past. This Chandra X-ray image shows a divided neighborhood where some 200 hot, young, massive stars reside. Bubbles in the cooler gas and dust have been generated by powerful stellar winds, which are then filled with hot, X-ray emitting gas. Scientists find the amount of hot gas detected in the bubbles on the right side corresponds to the amount entirely powered by winds from the 200 hot massive stars. The situation is different on the left side where the amount of X-ray gas cannot explain the brightness of the X-ray emission. The bubbles on this left side appear to be much older and were likely created and powered by young stars and supernovas in the past.